One robot with two cleaning patterns, V8S is updated with two cleaning patterns, vacuuming and mopping. 750ml super dustbin makes it cleaner and more efficient, its road rover wheels can easily climb 15 slopes and overcome most obstacles. With the bigger parts, V8S can vacuum and mop dust, grimes and stains which hidden in kitchens and other large spaces more effectively. Six cleaning modes suit different needs. Auto mode for cleaning automatically, Edge mode for corners and edges, Spot mode for a focused area, Schedule mode for setting a cleaning plan. Accurate and stable, smart planned cleaning system instantly corrects the cleaning path, achieving maximum coverage in less time. Smart sensors avoid stairs and drop-offs. Smarter hybrid vacuuming / mopping robot, V8S will become an important and capable member of your family. It is updated with two cleaning modes cleaning and mopping. Vacuuming by dustbin and mopping by the water tank, it is very easy to shift the working types. V8s mops the floor with an invisible barrier. In mopping mode, the V8s moves forward in a 23ft x 23ft area, creating a blocked off area behind it. That makes v8s an efficient and methodical dry and wet cleaner. Updated pet hair care system enhances the suction strength. And with a self-adjusting suction mouth, it effectively improves the cleaning performance on picking up pet hairs on the hard floor. With the award-winning, upgraded i-Dropping system, V8s has precise control over the amount of water dropping for hard floor mopping, preventing floor and cable damages. V8s keeps you informed with simple icons on its LCD display. The mechanical keys on its body or the remote give an immediate response to your commands. V8s works up to 120 minutes, when the power is running low, the robot will automatically recharge and resumes cleaning. This will protect furniture better than other systems. IR sensors will detect edges and avoid falling down stairs, it will avoid the obstacles and change direction automatically. Whether it is confetti debris, cigarette butts and ash, or beans and seeds shell, it is easy for you to clean them up. Suitable for the floor, cement, ceramic tile, wooden floor, undercoat carpet. This robot to work in narrow space, it is possible to clean under the bottom of furniture and around its corners. Want to be notified when the Ilife V8S Robotic Vacuum Cleaner with LCD Display gets even cheaper? Make sure you snag the best price by entering your email below. We'll email you when the price drops, free! We're tracking the price of the Ilife V8S Robotic Vacuum Cleaner with LCD Display every day so you know if that deal is really a steal! Check back for to check the best price for this product - and whether its current sale price is really the cheapest it's been! 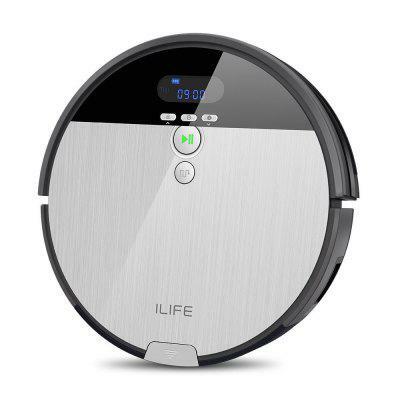 No Ilife V8S Robotic Vacuum Cleaner with LCD Display coupons found!